Acute tumor lysis syndrome after anti-pd-1 immunotherapy nivolumab for metastatic melanoma. Citation: Brunnhoelzl D, Wang J. Acute tumor lysis syndrome after anti-pd-1 immunotherapy nivolumab for metastatic melanoma.. J Mol Oncol Res. 2017;1(1):5-6. Checkpoint inhibitors; Anti-PD-1 Immunotherapy; Nivolumab; Tumor lysis syndrome (TLS); Metastatic melanoma; Oncological emergency. Tumor lysis syndrome (TLS) is an oncological emergency caused by the sudden, rapid death of cancer cells spontaneously or after chemotherapy, commonly in patients with aggressive lymphomas and leukemias, [1-3]. Nivolumab is a fully humanized, monoclonal, immunoglobulin G4 (IgG4) antibody to PD-1 [4,5]. To the best of our knowledge, TLS was rarely described in patients with malignant melanoma, and TLS associated checkpoint inhibitors has not been reported in literature. A 76 -year-old male with history of multifocal melanoma involving maxillary and left nostril (T3NxM0) diagnosed in June 2015, who was treated at outside hospital with resection and adjuvant XRT. One year after initial diagnosis, he presented to our hospital with 20 lb weight loss, fatigue and abdominal bloating. A computerized tomography (CT) scan of the chest abdomen and pelvis with and without IV contrast revealed widely metastatic disease involving lung, liver, kidneys, omentum, adrenal, bones (Figure 1). 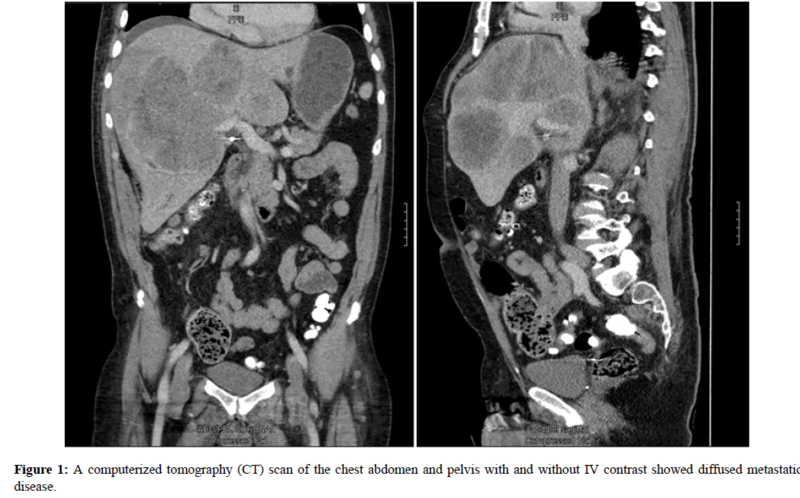 Figure 1: A computerized tomography (CT) scan of the chest abdomen and pelvis with and without IV contrast showed diffused metastatic disease. A biopsy of liver lesion was consistent with metastatic melanoma (No mutation was found in C-kit and BRAF). After a thorough oncological evaluation, the decision was made to treat recurrence disease with Nivolumab. Five days after the third dose of treatment, he was admitted to hospital for altered mental status. His laboratory results were notable for hyperkalemia with potassium 6.7 mmol/L (Normal Range 3.6-5.0), hyperphosphatemia 7.1 mg/dL (NR 2.4-4.7), calcium 7.3 mg/dL (NR 8.5-10.3), sodium 136 mmol/L (NR 135-145), chloride 102 mmol/L (NR 100-110), carbon dioxide 16 mmol/L (NR 19-27), BUN 110 mg/dL (NR 8-25), creatinine 3.9 mg/dL (NR 0.57-1.11), anion gap 16 mmol/L(NR 7-15), and uric acid 15.9 mg/dL (NR 2.6-6.3). The patient was treated with aggressive intravenous (IV) rehydration and nephrology was consulted. Unfortunately, his condition deteriorated rapidly. The patient’s family declined hemodialysis, and decided to take him home with hospice care (Table 1). Table 1: Blood chemistry values in a patient with acute tumor lysis syndrome. Checkpoint inhibitors have revolutionized the treatment of patients with metastatic melanoma, offering improved responses and significant survival benefit. Understanding the potential complications of these novel therapies is critical in optimal clinical management of patients with metastatic melanoma. Our case demonstrates that administration of anti- PD-1 immunotherapy nivolumab may induce acute tumor lysis syndrome. Considering those immunotherapies are increasingly used in advanced cancer, oncologists should be alert to this potential complication. Frequent laboratory monitoring, appropriate prophylaxis and prompt initiation of appropriate therapy are advised when treating elderly patients at high risk of tumor lysis syndrome. Howard SC, Jones DP, Pui CH. The tumor lysis syndrome. N Engl J Med. 2011; 364(19): 1844-54. Mott FE, Esana A, Chakmakjian C, et al. Tumor lysis syndrome in solid tumors. Support Cancer Ther. 2005; 2: 188–91. Coiffier B, Altman A, Ching-Hon P, et al. Guidelines for the management of pediatric and adult tumor lysis syndrome: an evidence-based review. J Clin Oncol. 2008; 26(16): 2767–78. Luke JJ, Ott PA. PD-1 pathway inhibitors: the next generation of immunotherapy for advanced melanoma. Oncotarget. 2015; 6(6): 3479-92.